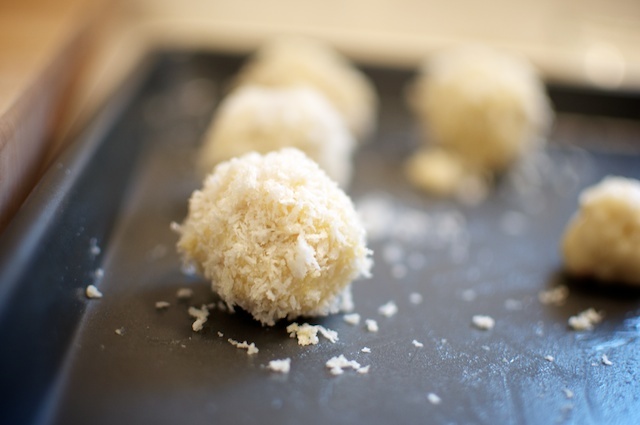 And here’s another recipe from the Food52 community. 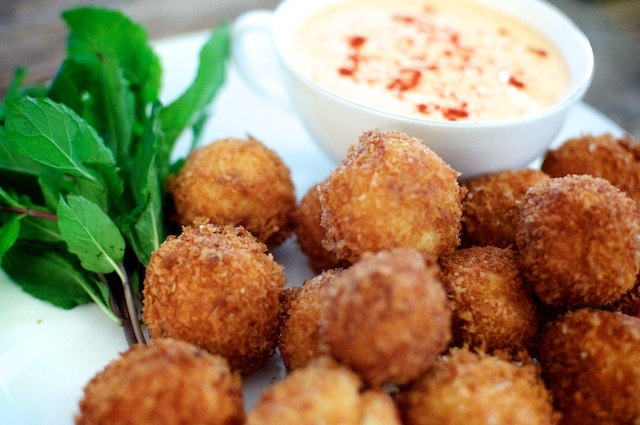 Croquettes! 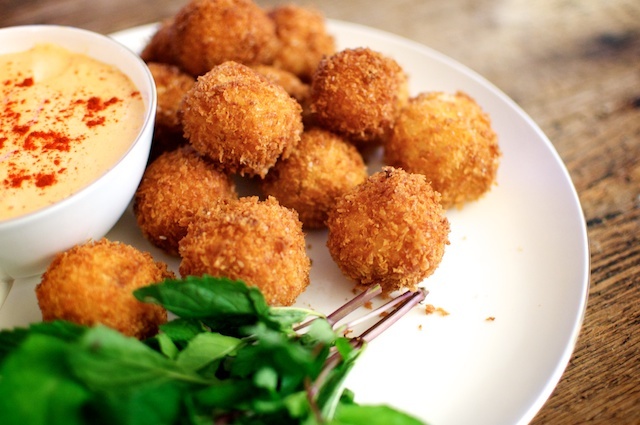 I also called them “magic-Spanish-cheesy-balls-of-goodness.” To be honest, I’ve always thought croquettes were potato based, since they taste so fluffy. Nope. Just a beautiful dough of butter, oil, milk and flour that comes together to taste like creamy mashed potatoes. This was my first foray into the deep-frying world. Deep frying is fairly simple . . . about an inch of vegetable oil in a large pot. I even found one article that said the moisture from the food rushes outward which keeps too much oil from seeping into the food. So maybe one could call it healthy? Probably not. 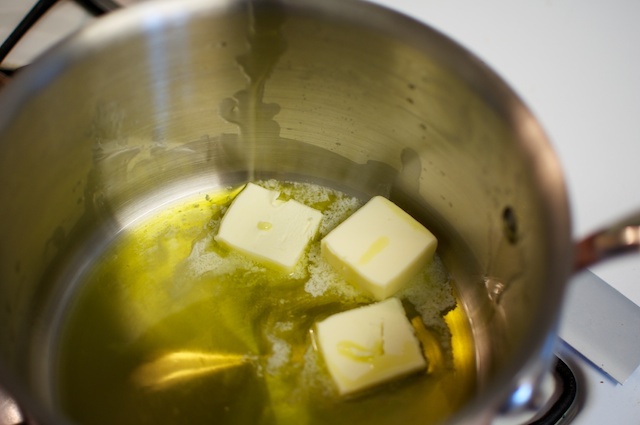 First up, heat a little oil and butter in a large sauce pot until butter is fully melted. 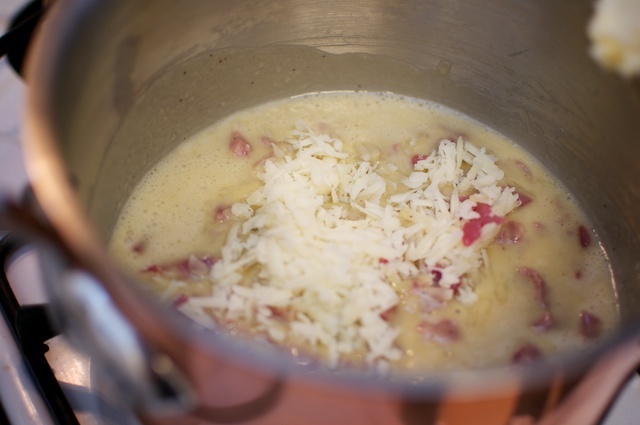 Switch to a wooden spoon (so your whisk doesn’t get gummy) and add ham, cheese and nutmeg. The mixture will start to pull away from the sides of the pan. Taste the dough and add any salt if needed. Spread mixture on a cookie sheet and let cool. Cover with plastic wrap and chill for 1 - 2 hours or overnight. 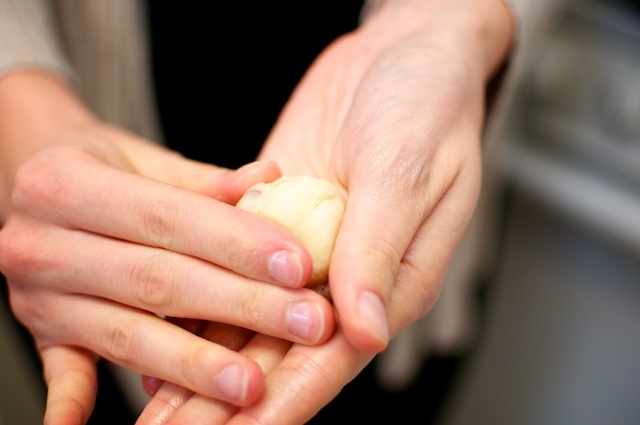 Using a spoon, scoop up chilled dough and form into little balls with your hands. Next time I will make them a little smaller, as I found it would be easier to eat if each one was bite sized. And now comes the fun part. 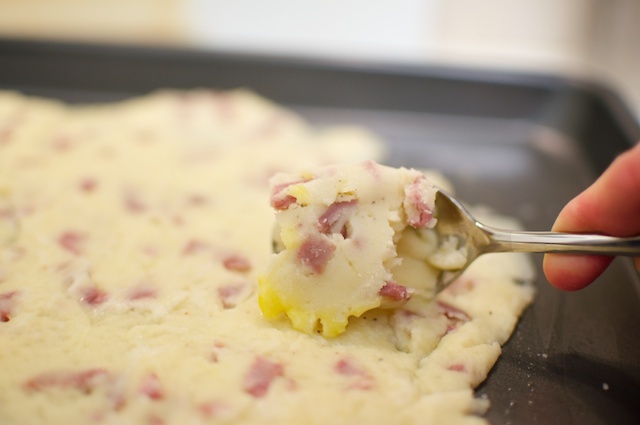 Fill a pot with enough vegetable oil to cover the height of the rolled dough. Heat it on medium high heat until the oil reaches 350 - 375 degrees F. You can use a candy thermometer to monitor, or you can just wait 15-ish minutes. 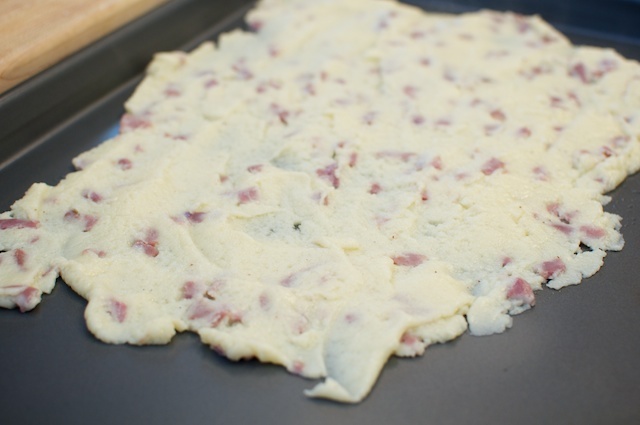 It won’t be bubbling until you add the dough. And a few glamour shots . . .
Heat oil and butter in a sauce pan until completely melted. Add flour and whisk continually for 1 - 2 minutes. Add milk and whisk for another 2 - 3 minutes. 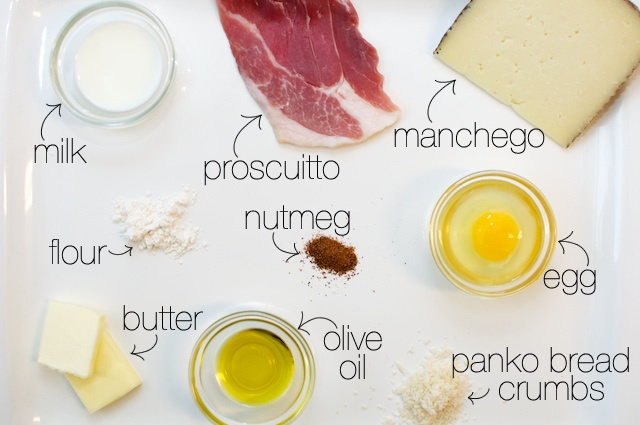 Using a wooden spoon add the nutmeg, proscuitto and manchego and stir to combine. The mixture will start separating from the sides of the pan in a few minutes. 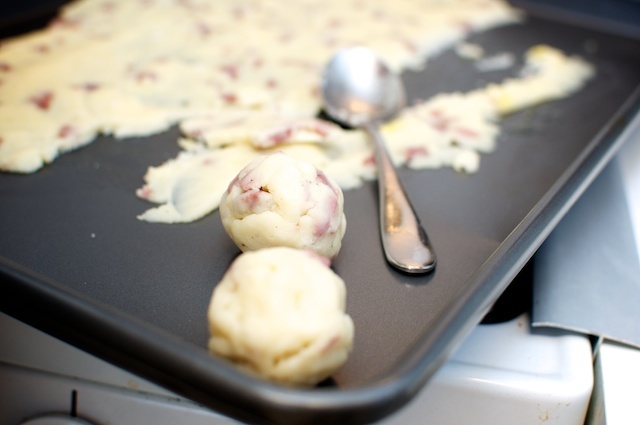 Scoop chilled dough with a spoon and form into bite sized balls. Beat eggs in bowl and add bread crumbs to a separate bowl. Salt both. 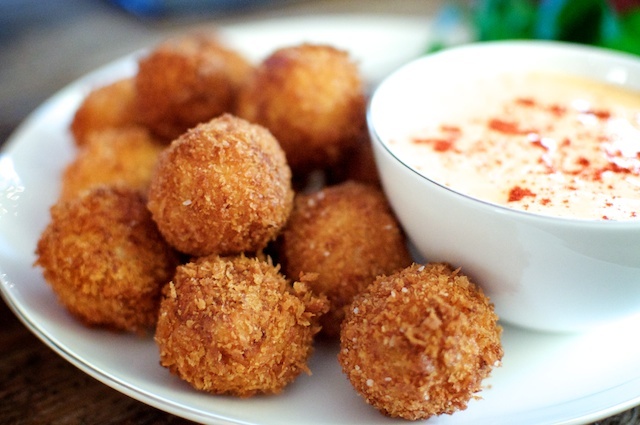 Dip balls into egg mixture and then breadcrumbs returning to the cookie sheet. Chill for another 1 - 2 hours. 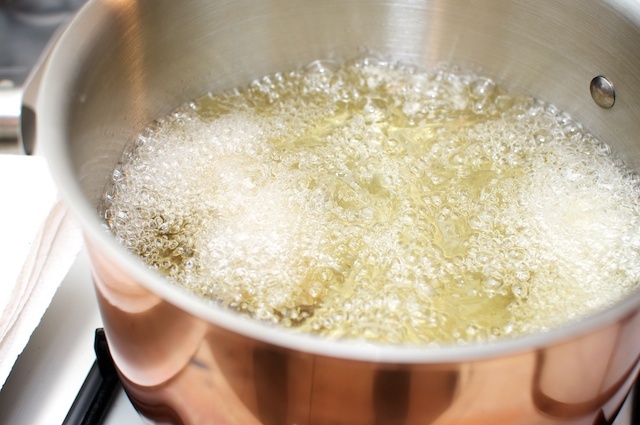 Heat vegetable oil in a large pot. There should be enough to cover the top of the balls. Heat to 350 - 375 degrees F. Working in batches, add balls to the oil for about 2 minutes or until they start to turn golden brown. Remove and place on paper towel to drain. Combine all ingredients in a food processor or blender. 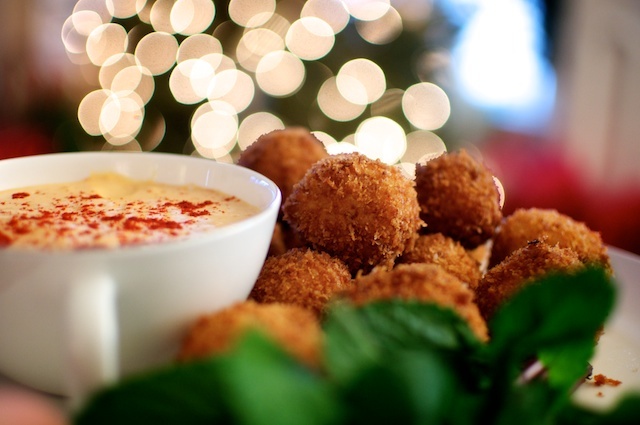 Place in a bowl and chill until ready to serve.